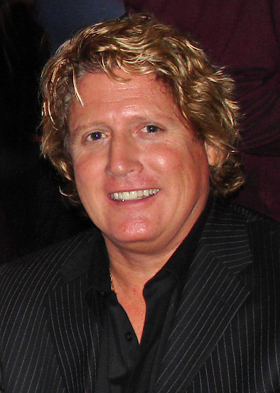 Castello Cities Internet Network (CCIN) CEO and President Michael Castello was one of the first true domain name visionaries. 20 years ago when only a handful of people even knew what a domain was, Michael knew what they could be. In fact, he was so sure they would irrevocably change the world he started building what became one of the best portfolios in the domain industry. 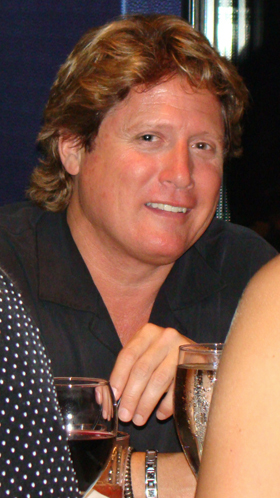 Michael, both individually and collectively as part of the legendary Castello Brothers, has had many triumphs along the way, both in domain investment and domain development (PalmSprings.com, Nashville.com and Daycare.com being prime examples of the latter). His latest and one of his greatest successes - being announced in this story for the first time anywhere - was the sale of Whisky.com for $3.1 million in a deal made on New Year's Day (2014). The blockbuster sale was for the domain name only - a domain that Michael had registered at the dawn of domaining - when it cost nothing to register a domain name! summit. From this point on - for the first time in a DN Journal Cover Story - I am going to get out of the way and let Michael tell you the entire story in his own words. He lived it and no one else can tell it better, so let's all sit back and enjoy! Back in late 1994 I had a vision of what a virtual world could look like with the introduction of the commercial web to the public. I felt there would be an exodus of people moving from the industrial world into the virtual world. A decade earlier I was using the stage name Michael Seven. As an accomplished singer/songwriter I learned much of my trade in New York City and was taken under the wings by Tin Pan Alley songwriter great, Lou Stallman. 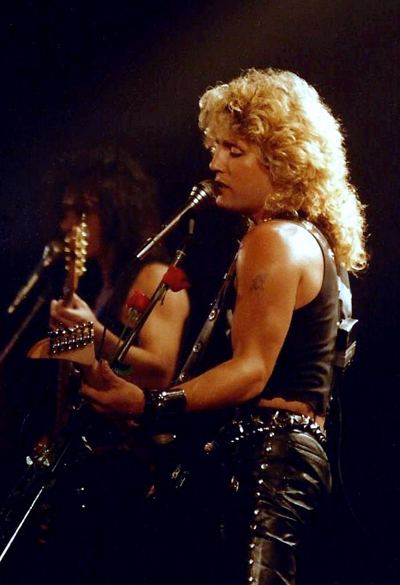 After some success in New York City, my brother David and I moved the band to Los Angeles where we performed in the local music scene playing clubs such as the Roxy and Whisky a Go Go. news. My wife made me the best meals trying to get me healthy. We were even gluten free back then. No processed sugars, only healthy eating and juicing. After two years of waking up with the thought of dying, Sheri convinced me to go to another clinic. They said they would give me the results after New Year's whether the tests were positive or negative. After several weeks, Sheri told me the doctors normally don’t do this but since it was Christmas, they wanted me to know that I did not have a terminal illness. In fact, I didn’t have anything wrong with me. “Nothing!? !” I remember putting my face in my hands. I couldn’t believe it. During those two years of struggle I spent a lot of time on the computer and I made some of the best decisions of my life. It was 1994. I still didn’t exactly know how to get a website online but I knew I needed to. I had so much to learn about this Information Super-Highway. The name of my production company at the time was Powwow Productions. I wanted my musical website to be called Powwow.com so I went about trying to figure out how to get that name. I eventually registered Powwow.com after many months of trial and error. Most domain names were available like Hollywood.com or 777.com. Why would I need those, I thought? After a few months I again checked the whois for Hollywood.com and realized it and many others had been registered in the previous weeks. It hit me like a freight train that there were others grabbing these domain names. I decided to register more, one being Whisky.com. I had the original registration in March of 1995, and I registered it for free. I always liked Scotch whisky, but the real reason I registered Whisky.com was because of the Whisky a Go Go night club in Hollywood. I always enjoyed “The Whisky”, with its musical heritage and scene where the likes of The Doors and Janis Joplin played. 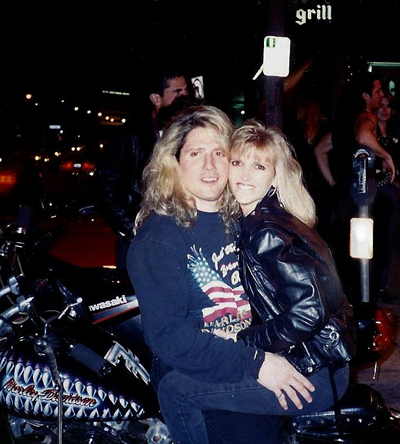 Years later, I even offered Whisky.com to the owner’s son and he told me he didn’t need it since they already registered WhiskyaGoGo.com. That rejection would prove to be good for me. money back then, and after all, the names were free to register previously. I needed money to keep the names that I had registered for free, but now would cost me more then I had. I received an email one day in 1996 from someone in Germany. A professor wanted to purchase Whisky.com. I thought I could possibly make some money and I offered him the name for $1,000. He told me he could register any domain name for $100 and declined my offer. I told him that $100 was no incentive for me to sell. Funny thing, he wrote me the very next year and offered me the $1,000. I told him what was $1,000 last year was now $10,000. He scoffed and said that was preposterous. Lo and behold, a year later he again came back with an offer of $10,000 and again I told him what was $10,000 last year is $100,000 this year. I never heard from him again. Over the next several years I created a website for Whisky.com. It was a pretty expansive site at the time since I created a page for every brand of whisky – and there were hundreds. The site took on a life of its own, ranking at the top of search for just about every type of whisky. There were several large conventions, like WhiskyFest and WhiskyLive, and I decided to make some Whisky.com business cards and attend a few events. 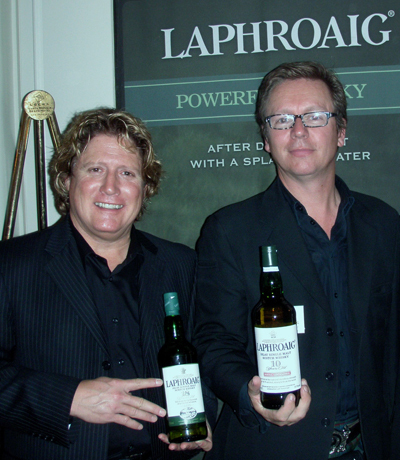 Michael Castello at one of the many whisky connoisseurs conventions he attended to learn more about the industry. gave me their full attention. I realized this is what happens with a Hyper Domain Name like Whisky.com. There is already a built in trust factor, and it greets you like a Lamborghini in the fast lane. 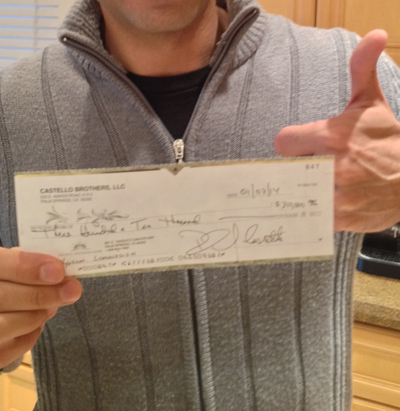 Toofun of TorontoDomainer.com holds the $310,000 Castello Brothers check he received for brokering the $3.1 million sale of Whisky.com. It took just seven days from the time the name was listed to find a buyer. I was doing business in Toronto in 2013 and while on the jet I remembered a domain blog named Toronto Domainer. I wrote a post on this blog telling the author, Toofun, that I would be in his neck of the woods and asked if he would like to join me for a few drinks to talk domain names. Toofun wrote back that he would. At the time, he was dealing in three to four figure domain name sales, and he was also a camera operator for several major films in Toronto. He told an incredible story of his family fleeing the Iranian Revolution, explaining how his mother and siblings went from country to country trying to survive, hoping eventually to reach the USA. He mentioned how he would love to come to California; I told him to book a flight and I would introduce him to the area and some of my friends. He took me up on my offer, finally settling in Los Angeles and eventually getting his green card! I remember him sitting across from me one morning, at the local coffee shop on the beach. He said, “I would like a chance to sell one of your premium domain names”. I thought about it for a second and said I would let him sell Whisky.com – but I wanted 3 to 5 million dollars for it. He said he would get right on it. I believe that, in life, the things that you want, you have to ask for, and I appreciated that moment. impressed, but I told him that he needed to get more for the name. At the time, I had another inside contact at a major whisky distillery that was pushing his company to make me a $3 million offer and I told Toofun about it. The next day, Toofun told me of a new $2 million offer from Whisky.de, and I knew that one was going to be a solid end user – but I still needed more. I knew that I was asking Toofun to turn down a lot of money in commission, but I told him he needed to put that aside and understand there was no difference between $10,000 and $10,000,000. It’s just a number. He said that he understood, and he had learned that in his acting class and would use that mindset going forward. him that a name like Whisky.com not only made his market local, but global. The buyer eventually agreed to a two month NDA. Our lawyers drew up contracts, and the money was wired on January 2nd, 2014. 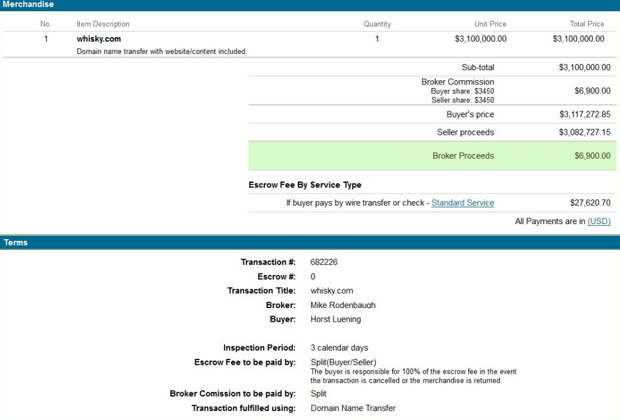 Escrow.com screen shot showing the final details of the Whisky.com sale at $3.1 million. The deal ran smoothly. I, as the seller, felt the name was worth more, and the buyer felt the name was also worth more. As I told the buyer, the right person bought it at the right time. Whisky.com is now owned by the largest supplier of whisky in Europe, and I believe that with this name, they will soon be the largest supplier of whisky in the world. I believe the English language is the language of commerce. We use words to command our computers, phones, and televisions. To own a word that can command a thought, product, or service, is tangible and invaluable. You have your own distribution network that is pre-branded. That saves global businesses millions of dollars in marketing. I want this story to be told because it is a great “rags to riches” story. It is an adventure that will only get better as we transition from an industrial economy to a name economy. Toofun made a $310,000 commission from just one sale. He went from selling four-figure names to seven-figure names in only seven days. It still amazes me how much power and leverage these names command!